Zero-sort is one word for single-stream recycling, as opposed to double stream where paper/cardboard is separated from glass/plastic. It is easier for the average person to not have to sort recycling, but to be able to put it all into one container. Data shows that in areas where single-stream recycling is available volume tends to go up drastically. 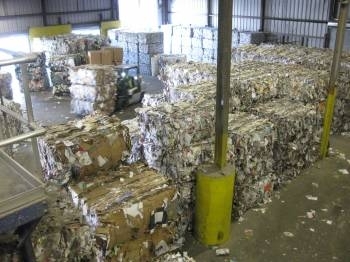 It’s amazing the various methods they use to separate the different kinds of recyclable material. The material is pushed onto a moving belt which has certain sized roller/slots that shake to capture a certain size of material. There are also optical sorts which have computers sending light rays down to the material and back up to the computer-when they detect what it is, 160 air jets can shoot it across a divider gap into one stream or it will fall down the gap to another belt. One interesting fact is that each of these items that is being separated out and being recycled has to have a market that the recycling plant is selling that item to. There is an always-changing matrix of commodity prices, much like the stock market in which prices also change every day. In 2008 there was a commodity crash where all of the commodities went down in resale price and they still haven’t rebounded. 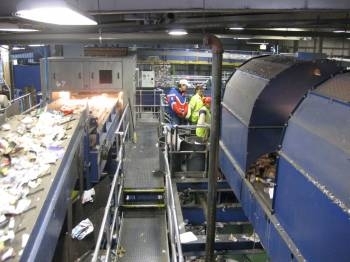 This caused many small recycling facilities to close because they couldn’t recoup their expenses. Casella collects and sells glass but the price they receive is less than their cost of shipping to the glass recycling plant. They are losing money on the glass, but making it up in other departments. The availability of a market for each commodity depends also on where the plant is geographically. The coastal US is able to recycle some items which the middle of America is unable to because it is cheaper to send some items overseas on a boat than it would be for them to ship in trucks. 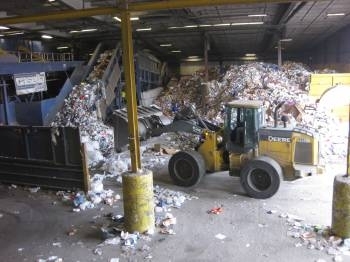 This is one reason different localities have different rules about what can and cannot be recycled. One valuable piece of information I learned for my recycling habits at home was that out of the 5-6% residue, (the percentage of items that cannot be recycled) 90% of that is plastic bags. 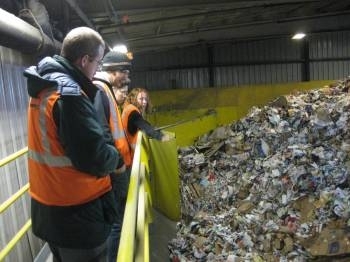 Plastic bags are the number one material that the quality control staff are removing from the moving belts. Plastic bags are not recyclable when mixed with other materials and contaminated. If you wish to recycle your plastic bags please take them to the supermarkets and stores where you can recycle them in one container that only holds the plastic bags and will not get contaminated. Thanks to Lisa who brought us around the plant and answered our many questions!